2. In a bowl, place the chicken pieces, cubed potatoes, shallots, garlic, chopped tarragon, honey, 1 tbsp. olive oil, 1 tbsp, sesame oil. Toss to combine and coat the ingredient together. 3. Transfer into a roasting tray and place in the oven for 35 -40 minutes until cooked through and caramelised. shake the roasting tray every 10 minutes to evenly colour the chicken and potatoes. 4. When the chicken is cooked, prepare the pakchoi. Preheat a large wok or saute pan over very high heat. 5. Quickly sear the pakchoi with 1 tbsp oil and 1 tbsp. sesame oil for 30 seconds, then add some water and seasoning and cover with a lid to create steam. Cook for a further 2 minutes until just cooked and still crunchy. 6. Remove from the heat. 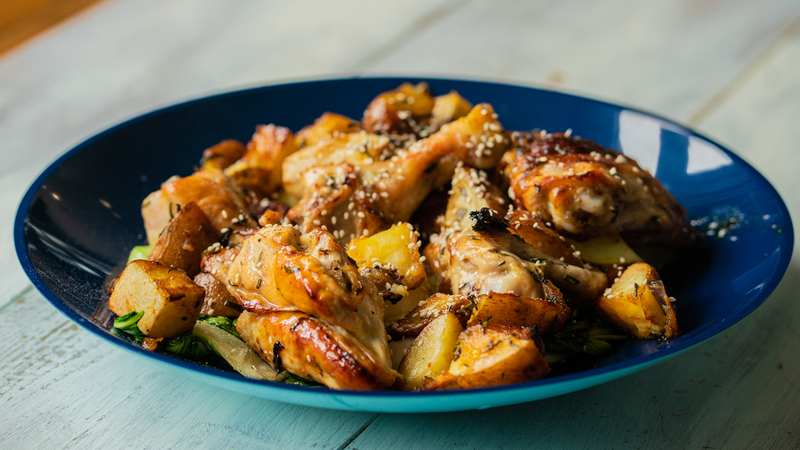 Place the pakchoi on the bed of the serving dish and top with the tarragon and honey chicken and potatoes. Sprinkle with sesame seed and serve immediately.